Golden Doodles are a wonderful cross breed that have many great characteristics from each breed. They are wonderfully affectionate and friendly like the Golden retriever and have the more nonshedding or low shedding, hypoallergenic coats like the poodle. They are perfect for families who suffer from mild dog allergies. F1b litters can still produce all three coat types: curly, wavy, and straight. There will be more of the curly and wavy coats and fewer straight coats in this type of litter. 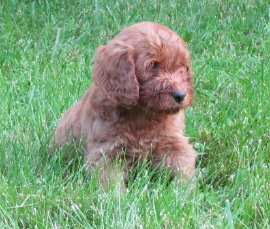 Our upcoming cross is an f1b cross, which is a Golden Doodle crossed with a minature poodle. These will be miniature to medium Golden Doodles with the least allergenic coats of the doodle crosses. Clover is an F1 Golden Doodle. She is sweet and silly and thinks everyone is a great friend. She has a beautiful, soft, wavy Golden Doodle coat and weighs about 38 pounds. 24 pound, red, miniature poodle. He loves being a lap dog and is wonderful in the house.